It is very common for a worker to injure his neck or back while on the job. If that injury causes pressure on the nerves running down the spine, the injured worker will feel radiating pain shooting into his arms or legs. A doctor will often recommend epidural steroid injections to treat this problem. Epidural steroid injections are performed by doctors who specialize in Pain Management. The doctor uses a needle to inject steroids into the dural sac, which is an area inside the spine that surrounds the spinal cord and nerves. The injection is given inside the doctor's office. 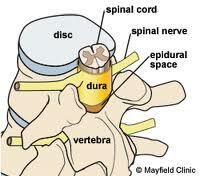 The hope is that the injection will decrease the swelling in the spine, therefore decreasing pressure on the nerves. There is approximately a 50% success rate. If successful, the radiating pain will lessen or possibly go away completely. A doctor won't give more than three (3) of these injections to the same disc level per year. Most commonly, an injured worker will need epidural steroid injections because he suffered a disc herniation or disc bulge, spinal stenosis or degenerative disc disease. There are many ways that a worker could suffer these types of neck or back injuries. They could occur as a result of specific accidents, such as lifting injuries or slip-and-falls. They could also occur as a result of occupational exposures, where repetive bending, lifting, and twisting over a period of time causes problems to the neck and back. If you or someone you love has been injured on the job, it is important to contact a local NJ workers' comp attorney immediately. The law can be confusing, but a proper attorney can get you the help you need. Manfred F. Ricciardelli, Jr. has been fighting for the rights of injured workers for over twenty years. He will help you build your case and get you the benefits you deserve, including compensation for your medical bills, time lost from work, and your pain and suffering. Call us today for a free consultation at (973) 285-1100 or fill out our online contact form.